Since starting this project, my love for this town just keeps multiplying. I’ve been so fortunate to be surrounded by this community of unique shops, businesses and artists that are helping the dream of Evelyn’s Wine Bar become a reality. To start, I happened upon a beautiful space with a very open-minded, patient and helpful landlord. First, he’s letting me put a wine bar in his building. Second, he held the space for me for 4 months. But what’s really impressive is that Scott has put his own sweat into this effort. He wanted to help me save money, so he offered to help with the demo. I’m pretty sure he didn’t think it would take the amount of hours it has taken. He even brought one of his employees to help the day before the 4th of July! Thankfully, he knows what he’s doing and has the equipment we needed (i.e. owns a rental business). Next, I hired Larson Building to lead the construction. They are based in downtown Buffalo and usually oversee church, senior living and larger commercial construction. But, agreed to help me out with my unique little project (at the height of construction season, no less). This project has been a bigger beast than expected. It’s an old building and we’ve uncovered all sorts of fun challenges along the way. They just keep patiently leading the charge and managing the obstacles. When it came to the bar, it had to be special. There is a great store in Buffalo called Biggs & Co. One of the things I love about this store is the unique furniture. A lot of it is custom designed and built by Tom Biggerstaff. 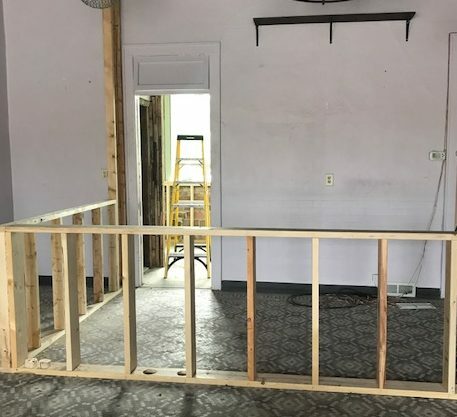 When I walked into the store a few months ago to see if Tom would be interested in building the Evelyn’s bar, I had no idea how helpful this family-run business would be! Tom is one of three siblings involved in Biggs & Co. It was actually his sister, Amy, that I spoke with first. She is the CEO and manages the business. She not only put me in touch with Tom, but she has had multiple great design ideas and introduced me to her other brother, Jeff. Jeff is an incredible artist (check out his work). He will be painting some amazing pieces for one of our interior walls. To say they have been helpful with the interior design of Evelyn’s is an understatement. I’m so excited for everyone to see what they have done! However, it’s not just the big items, it’s also the local finds. I keep going back to the Porch & Atelier because every time I go in there I find something. Candle holders for the tables and a beautiful chandelier that will be the focal point when you peak into Evelyn’s window. And, then there is Bella Ella’s. So far I’ve purchased more for my house than Evelyn’s because I always find things I like there that I want to keep at home. But I do have a cute mirror that I’m going to put in one of the bathrooms (if I don’t put it in my daughter’s bathroom). I’m pretty sure there is more to find there, as well as many of the other unique shops in town. So, I guess when it comes down to it, I’m saying please check out all the stores and businesses in downtown Buffalo. I don’t know how I would have built Evelyn’s without them. There is so much here. I’m so excited to be a part of it!